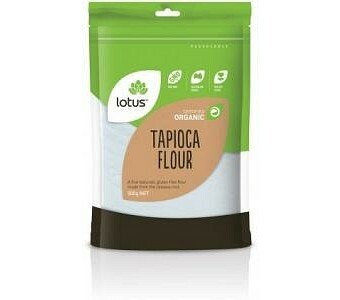 Lotus Organic Tapioca Flour is a fine textured, gluten free flour made from the cassava root. Tapioca flour, sometimes called tapioca starch is broadly used as a thickener for sauces, soups and stews. It can also be used in baking. Ingredients: Tapioca. No Preservatives or Additives. Certified Organic by ACO.